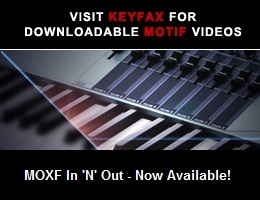 Viewing topic "External MIDI out for a performance part?" Is there a way to assign one of the four parts of a performance to external MIDI out? It would be great to have a zone that controlled an external sound module (e.g. Roland JP-08) in combination with three other internal voices. If this cannot be done in the MOX, does anybody know if it can be done in any of the other more advanced Yamaha keyboards like the Montage? Performance mode is limited to all Parts being on the same MIDI channel, typically Channel 1. That presents some limitations for use with an external sound source. You could copy a Performance to a Song or Pattern Mixing. Three of the Parts could be set to a single Receive Channel, emulating what happens in a Performance. Another Part could be set up as needed for the external module, with the track’s Transmit Channel matching the module’s receive channel. More capability can be attained if Master mode is used. Thanks for the tips! Looks like Master Mode is where I should focus my learning and efforts to do what I’m hoping to do.